Recent media stories often say that Red Hook is cut off by having water on three sides. That’s a view of water that’s very new. For centuries in Red Hook - and in this harbor - water was an asset and a connector. Use of the waterways is a like a language New York City has forgotten. We lost it some 50 years ago, and along the way, lost track of the history of our own waterfront. The term “waterfront” in NYC is now used mostly to talk about the land next to the water, but not the water/waterways themselves. PortSide is re-inserting water back into the conversation. We need to re-learn that language to plan for the future – for flood prep resiliency and ferry planning and moving goods by water and more. Threading through his project is the colorful story of the people of Red Hook. We will explore more individual histories in future updates to Red Hook WaterStories. 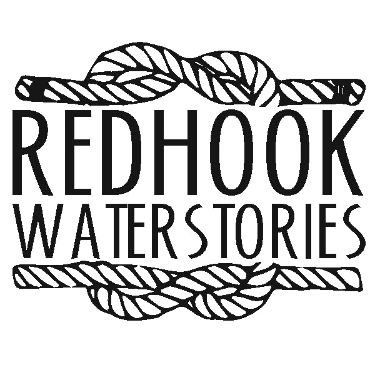 Red Hook WaterStories uses the current definition, eg the peninsula south of Hamilton Avenue with Gowanus Bay on one side and the Buttermilk Channel on the other. To not cut up the Red Hook Container Terminal and Marine Terminal, our study area goes to Atlantic Avenue along the waterfront into what is now called the Columbia Waterfront District. Once upon a time, “Red Hook” went as far north as Atlantic Avenue and as far east as the Gowanus Canal and included the current neighborhoods of Carroll Gardens, Cobble Hill and Boerum Hill. Over a century and a half, rebranding by real estate people whittled Red Hook down. As late as the 1960s, Carroll Gardens and Red Hook were called "South Brooklyn Red Hook" or “Red Hook” for short. Clicking the WaterStories logo at the top left of the page takes you back home. Use the Navigation bar near the top to explore by topics and themes. (Mobile: click menu icon at top right to reveal navigation and search.) This gets you all the content. Feature articles are not on the map since they don’t refer to a single location. Find them under Features via the drop down menu "Explore the past." Explore the Map to find information by the places associated with the content. (Mobile: first expand the Map.) The map has a Layers control at upper right, which you click to see the multiple layers you can use in your searches. Clicking on icons on the map accesses the content. On desktop computers, you see the map in your first view. (on Mobile, you click to expand the Map). A nautical chart is merged with the typical street map. Real-time data on commercial vessels with engines (not barges) shows the name of the vessel. Click on it for more about the boat. This data is generously provided by Marine Traffic in support of the educational mission of this project (read more at In The Water). To zoom in and out, use the + and - buttons on the top-left. Red, yellow or green circles with numbers indicate the number of items at that location. Click on the circle, and it will zoom in and begin to uncluster. Continuing zooming until you get to individual items. Click on an icon to get more basic information about it. Then click on the pop-up to navigate to even fuller information. Anchor icons are Highlights which you can reveal by clicking the Highlights box on layers. Highlights are sites of particular importance that have many Items associated with them. To close a pop-up that is open, click anywhere else on the map. Select visible layers using the Layers Control icon at the top-right of the map. Red Hook Retail Businesses are broken into categories. The “Other” category is a diverse catch-all that includes fitness, mini golf, gas stations and more. Community Resources shows non-profits, schools, police and fire stations, library, senior center, VFW, post office, etc. NYPL OldNYC Images is a large selection of Red Hook images from the New York Public Library's Digital Collections. PortSide will work to identify WaterStories associated with these sites. For now, we are showing the whole NPYL Red Hook set. Citi Bike stations are shown on the map when you click that layer. The status of each station is updated every few minutes with the number of bikes available and empty bike docks. MTA bus stations are shown when you activate that layer. The icon shows the direction the buses are heading. Clicking on the icon shows which routes stop there. Click on "Show Current Location" to see yourself on the map, identified by a little blue dot. Be sure to Refresh if you are on the go. Features are fascinating in-depth essays about various topics, written by experts in their fields, commissioned by PortSide NewYork. These are special to Red Hook WaterStories. These can NOT be accessed via the map because they are not associated with one specific site. Resiliency info is an exception to that map rule. Because resiliency info is so important, we wanted to make it easier to find, so we created “Resiliency Island” a bock of text on a buff background in the water near Fairway that you can click. You can also find resiliency info under "Explore today" at the submenu "Resiliency: Flood Prep." This site is constructed using a powerful archivist software called Omeka. This means the site has its own internal search function and is not using Google search. The Search box (Mobile: reveal search using the Menu icon at top right) searches only Items, a designation in Omeka that does not include the Features. You can also click "Site-Wide Search" to find results on the whole site of all the categories of Omeka entries. Item search results are plotted on the Map. Each point on the map is an Item, but there are many more Items that don't have a specific location. You can browse, search, and get to Items by subject using the Items menu and sub-menus and also the Search box. Again, "item" is designation in Omeka that does not include the Features. You can easily get to all our Items about Maps using the submenu "Maps" under "Items". Items can be related to each other by Tags, Subjects and Item Relationships; by clicking on those links, you get to those other interrelated Items. Themes group several related Items together, so you can explore a topic. When in an Item, you can also see if that Item is part of a Theme, and easily get to any other Items.